Margaret Thatcher's controversial legacy is already merging myth and reality and nowhere is this more the case than around the thorny issue of the European Union. She was one of the architects of the 1987 Single European Act (SEA) - the treaty which gave us EU militarisation, the Single Market and the Single Currency - yet there are those who defend her claim she didn't know what she was signing. If this were true then history will only damn her further. In the picture on the right is Mrs Thatcher sitting next to Geoffrey Howe. Lynda Chalker used the Royal Perogative to sign the Single European Act Treaty on behalf of the Prime Miniser and her government. In order to develop the 'eurosceptic' Thatcher myth many fawning eulogies point to her Bruges speech in 1988 which attacked the coming EU centralisation she had done so much to construct. It was not only too little too late, but it gave the EU more ammunition to hit back and present itself as vaguely progressive to the Labour movement, vague being the most important part. 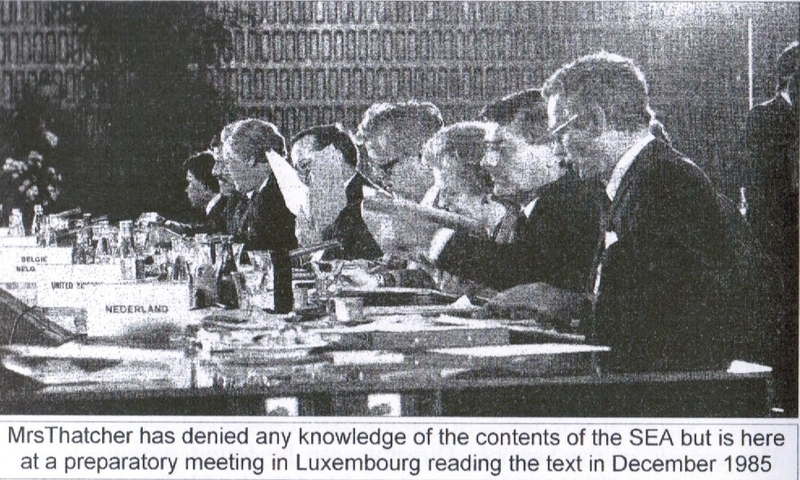 European Commission president Jacques Delors mendacious address to the TUC Congress in Bournemouth that year, offering full employment and mandatory collective bargaining across Europe, duped a generation of trade union leaders to believe that Brussels was 'the only game in town'. Journalist Larry Elliot captured the mood by pointing out that the Delors vision appealed to some of the less attractive traits of the left, such as: "the worship of power, the notion that there is always a big solution to the smallest of problems and the feeling that there is something unseemly about loving your own country". At this pivotal moment the foundation stones of New Labour and Blairism were being laid as delegates pitifully sang "Frère Jacques". So what was the 'Iron Lady's' true role in 'European construction'? Arch Europhile and Tory prime minister Edward Heath brought Margaret Hilda Thatcher into his government in 1970 before he dragged this country into the then Common Market in 1973. In the referendum 1975, Thatcher campaigned to keep this country in 'Europe' before she ousted Heath to become leader of the Conservative Party in opposition. One of the first things she did when she became Prime Minister after winning the 1979 general election was to remove all controls on capital as demanded by the European Community treaties. Her successive administrations fell into line with the needs of the EU and the finance sector by de-industrialising the country, shutting down steel and coal industries and eroding the manufacturing base, which led to mass unemployment paid for by revenues from North Sea oil. 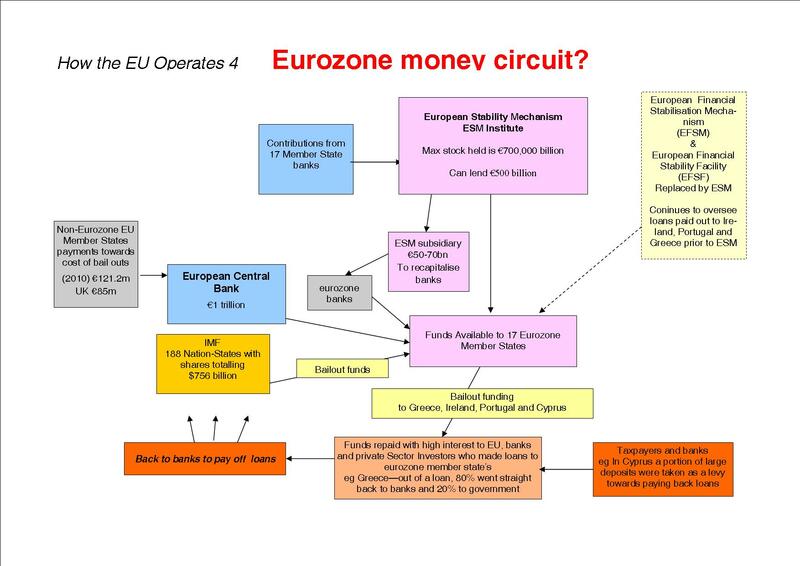 By 1983 the latest attempt at creating a European single currency, known as the European Monetary System had been causing economic havoc and was quietly abandoned. However the newly-formed European Round Table of Industrialists (ERT), made up of major global corporations, launched plans to deregulate European economies to allow big business to grab more industries in order to extract profit. A former Foreign Minister of Ireland chaired the secret Dooge Committee of the European Community which prepared a report on European Co-operation. Malcolm Rifkind was Thatcher's appointee to this committee. Ironically the ERT plans were enthusiastically adopted by Delors and European commissioner for the Internal Market Lord Cockfield, a creature of Thatcher. 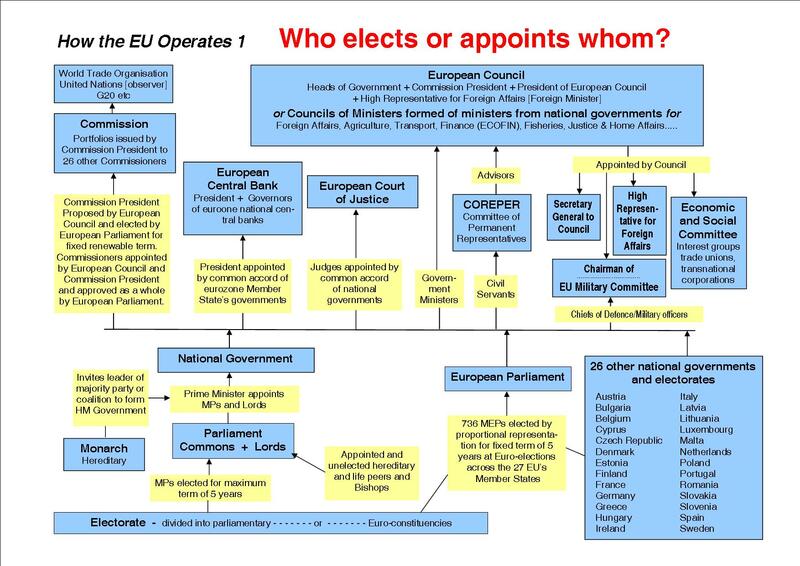 These plans with the Dooge Report formed the basis of the 1986 Single European Act and Maastricht Treaty. In the proposals, Lord Cockfield pushed through over 250 measures to remove barriers to trade by qualified majority voting. As Thatcher herself put it: "we wished to have many directives under majority voting because things which we wanted were being stopped by others using a single vote". Another Tory involved was the young John Bercow, later an MP, he said: "Margaret Thatcher was herself a driving force behind the Act and some of her ministers positively fizzed with enthusiasm about the Single Market which they believed achieved the Thatcherisation of Europe". This was followed by Thatcher's infamous 'big bang' de-regulation of the banks and the City, marking the launch of a rapacious and profoundly corrupt casino economy that has led us to the current crisis of capitalism. The Act also began the long process of EU militarisation, enshrining aspirations to create a single foreign policy and an EU-wide military-industrial complex to build and sell arms. This directly led to the hugely expensive project to build an EU fighter plane, the Eurofighter - a white elephant that has cost the British taxpayer over £25 billion at the last count. By the late 1980s all Thatcher's hard work was bearing fruit and led to the launch of plans for the Maastricht Treaty, designed to further centralise powers to the EU. It was at this point that she became more vocal in her opposition to the monster she had done so much to create. She opposed the fall of the Berlin Wall as she understood the power a revaunchist, reunited Germany could wield. But leading Tory Europhiles like Michael Heseltine quickly moved against her, forcing her to resign as Prime Minister and party leader in November 1990, "kicked out like a dog in the night" as Dennis Skinner put it. The arch Europhile John Major replaced her as Tory leader, forcing through Maastricht and among other things privatisation of the railways under EU directive 91/440. Any assessment of Thatcher must recognise her lack of original thought and judgment in favour of opportunism and subservience to a ruling class that serves its own interests above those of the nation as a whole.